Driving is not always a straightforward task. 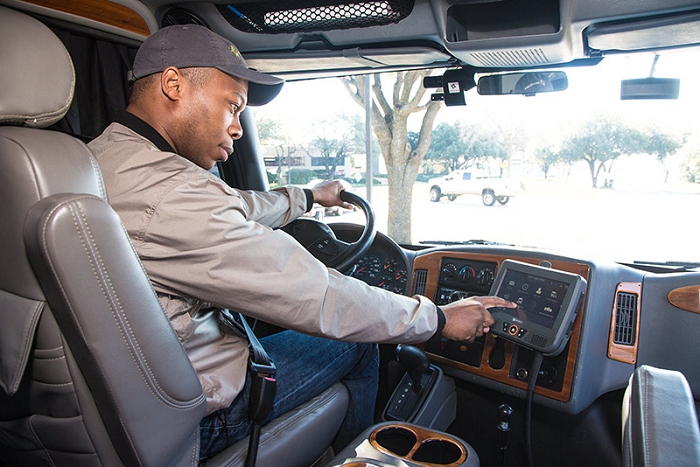 Motorists often confuse you (whether they’re in cars or bicycles), dashboard symbols sometimes distract you, and poor road infrastructure may mislead you. To add to the mess are traffic signs. 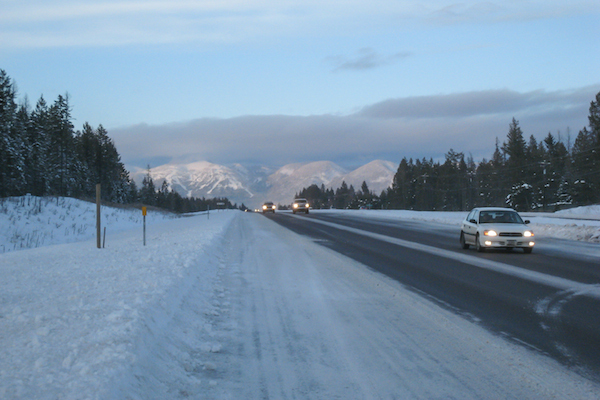 Ideally, a sign is supposed to clarify a condition of the road, whether it is to alert you of a sharp turn, a construction zone, or stray wildlife that may cross your path. But some road signs cloud judgment instead of giving a clear picture. 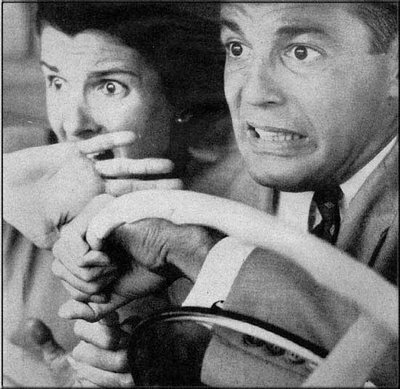 In fact, you may have your own stories revolving around a traffic sign that left you puzzled, derisive or annoyed. It’s too bad you can’t go around removing these signs, but there are ways around a confusing sign – you don’t have to spend your time trying to decipher them as if they’re morse code. With that said, it’s worth laughing at a few ridiculous signs. Some signs are hard to read not because of what’s written on them, but how they’re arranged. And for some reason, they’re usually the ones that point out directions. 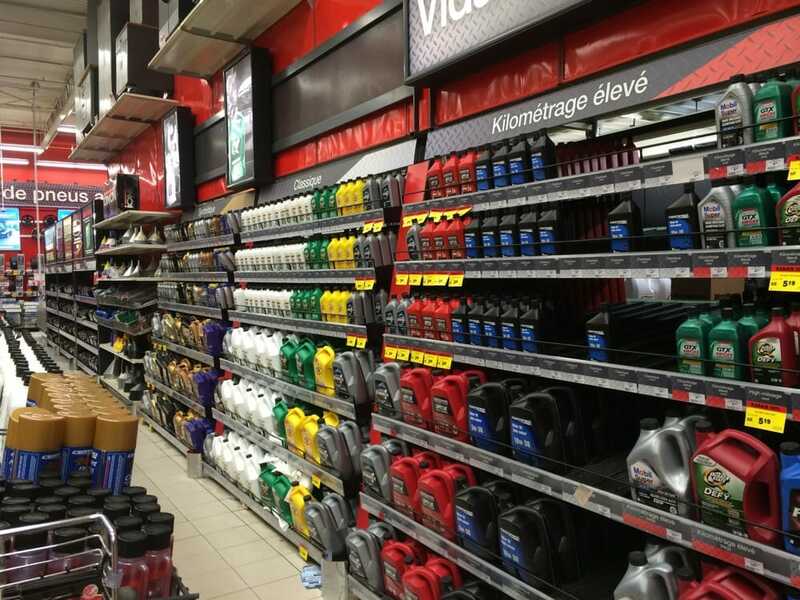 You’ve probably seen a few signs that identify where major road routes are, but are so cluttered, that choosing which way to go is like deciding whether you should choose the red or blue wire to defuse a bomb. All you can do is guess. 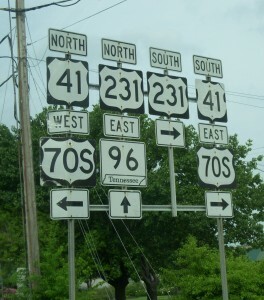 After a good long pause, you’ll realize these signs are saying that entrance points for highways 411 and 441 are available at different places. Initially? It looks like it was laid out by someone who didn’t do too well in geography class. These signs could have easily been separated to make the directions clearer. Instead, they’re stacked in a way that will make a laser surgery patient still question their vision. 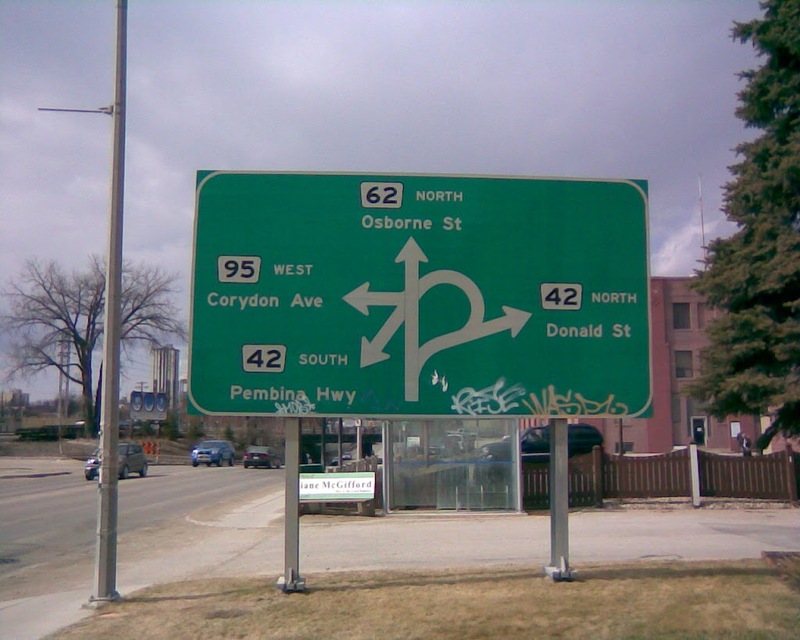 This sign, located in Winnipeg, Manitoba, is the roadside equivalent of abstract art in a museum. You’d have to stand there for a while to truly grasp what it’s telling you. It’s aptly called, “Confusion Corner”. Road signs that contradict themselves are another source of head-scratching. Again, the symbols and messages are usually clear, but their arrangement confuses drivers. 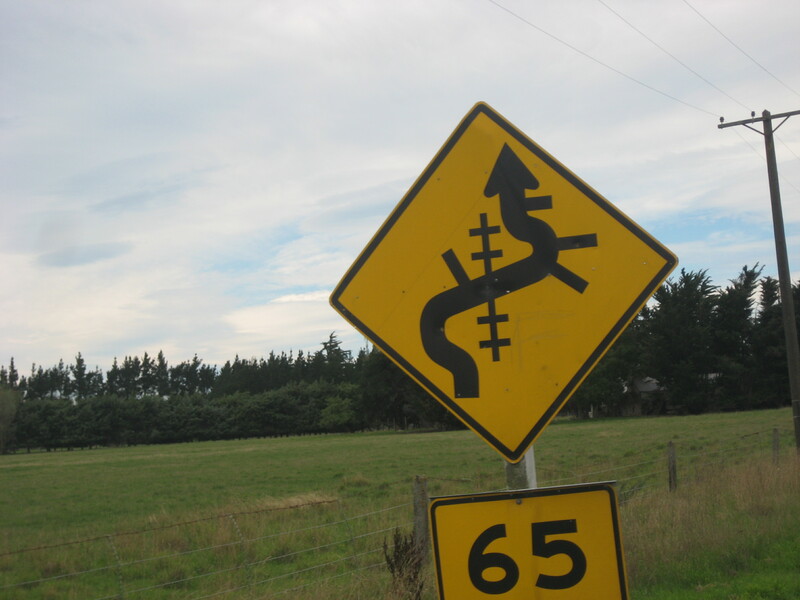 Usually, a driver with a sharp mind will understand the meaning behind the signs. The hope, of course, is that they make sense of it before it get’s them confused or pulled over by a cop. You’ll most likely get this one within a few seconds, but the arrow isn’t necessary. There’s something about the arrangement of these signs that screams “prank”. 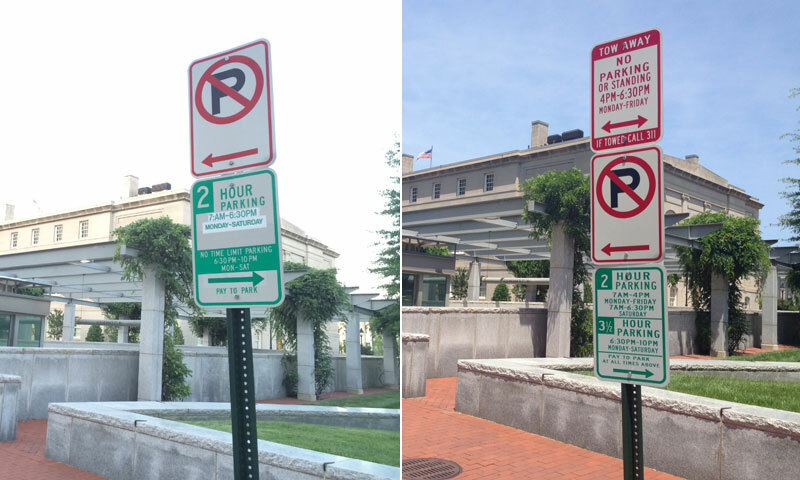 Located in Washington D.C., these parking signs are not just confusing, but strictly enforced. It’s funny because this brain teaser could be solved by just putting one sign, saying whether you can’t or can park, and the hours you’re allowed to do so. Some road signs just make no sense no matter how much you read into them. Of course, if you’ve read about a sign’s meaning in a book, you’ll recognize it when you see it. But that’s not the case if you’re seeing it for the first time. If you’re new to an area or just visiting, these signs will leave you scrambling to find their meanings like students trying decode one of Shakespeare’s poems. What is this? We get the speed limit part. The curled hair and arrow sticking above aren’t so clear, however. Maybe this symbol needs to find a new job as a business logo. 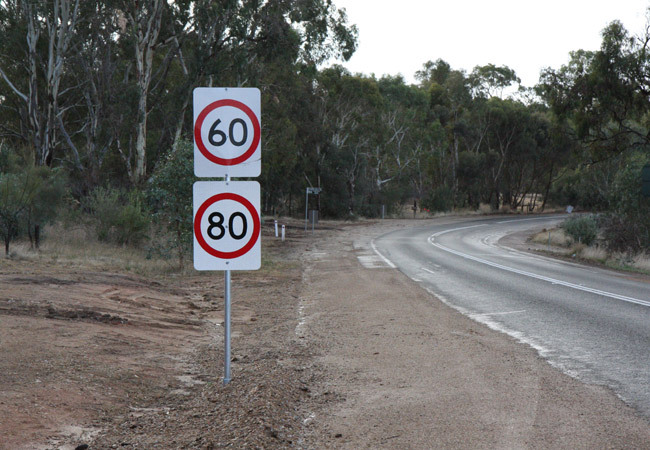 There’s a speed limit for a certain stretch of road, yes, but what’s the point of this symbol? The train-track and side-street markings add nothing to the speed limit posting itself. It could make a cool symbol for a fraternity though. Frightening yet somewhat hilarious is the sign pictured above. It appears to warn about the presence of glider tow planes, but the message conveyed here seems far more ominous (tow rope looks the path of a bomb…that’ll hit your car). There had to be at least one driver out there who saw this sign and made a U-turn because of it. If you come across a strange road sign, don’t let it turn into a dilemma. It might stress you out a bit if you’re unfamiliar with the road, but even then, there are steps to take so the confusion doesn’t get the best of you. The simplest thing to do if you’re not sure about a sign’s meaning, is to ask someone. Of course, you have to make sure that the people you ask are trustworthy. This is certainly important if you’re in another city or country. Asking questions about infrastructure immediately points you out as a foreigner, which can lead to some malicious people to take advantage of you. It’s better to ask friends, family members, and employees of nearby establishments. After all, if they play you, you know where they live (or work). We’re not advocating anarchy and rebellion against the law here. However, if you come across a sign that’s anything but obvious, perhaps something that looks more like a joke than an actual law, then it’s better to pretend it doesn’t exist. The reason we can say this is because some signs are too arbitrary to be understood. Additionally, many of these signs are poorly placed, and the combination of obscure symbolism and awkward positioning renders many of these signs useless anyway. Provided these signs have no numbers (to indicate speed), arrows (to indicate directions), or crosses (to indicate restrictions), you may be dealing with a sign that’s due for removal. Throughout your driving career, you’re going to encounter a ton of signs that make little or no sense. They’ll look like more like childish illustrations, obscure symbols, or phrases written by a person who had drank too much Vodka. However, they don’t have to trip you up. Many road signs are just the by-products of traffic officials who were too busy (or too lazy) to think about the arbitrary nature of symbols and words they used. Fortunately, finding out what they mean doesn’t require complex science. So whether you encounter a strange traffic sign here or in some other country, take comfort knowing that it doesn’t have to ruin your day or trip. Ask about it’s meaning, take pics and laugh about it later.